Could Your Employee turn Violent? Hiring the right employees for your Small Business is an important factor in your success. But what happens when instead of being an asset, that employee actually harms your Small Business? In this 3 Part Series, I have taken a look at Employees who can put Your Small Business in Danger. The final Installment ~ Violence and Addiction in the Workplace! 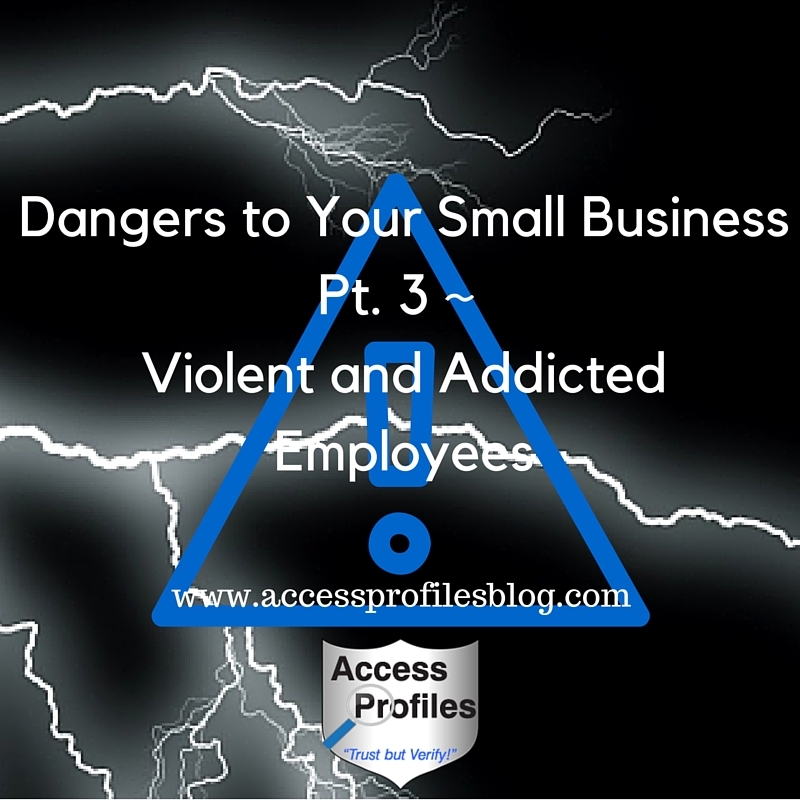 Violent and Addicted employees pose a special danger to Small Businesses. Not only are they a problem for your other employees and clients, they can have serious complications for your company. As with most Small Business dangers, prevention should be your focus. Doing what you can before hiring a dangerous employee makes sense. You need to review and, if necessary, update your hiring policies to include criminal background checks. At the minimum, this screening should include court record checks at the county and state level. Best practice is to cover all jurisdictions where your potential employee has lived for the past 7 - 10 years (unless different parameters are dictated by federal and local laws). For tips on getting the best criminal background check for your needs, read “Be Smart ~ Why You Need to Do More than Just a State Criminal Check”! In addition, you need to be vigilant about checking your applicant’s past employers and references. Dig into their workplace demeanor and behavior towards fellow employees and clients. Developing a sound Written Policy to deal with Workplace Violence is another important part of your prevention plan. This plan should include language that specifically prohibits any violent behavior and the consequences should it occur. Your policy should address violence on many levels. Verbal harassment that leads to physical contact, fighting, and even the more serious instances of assault. You should also include your stance on bringing weapons to the workplace. It is best to prohibit the possession of all weapons on company property. You need to communicate your workplace violence policy clearly and consistently throughout your company. Make sure everyone understands that there is zero tolerance for violent behavior and the ramifications if your policy is violated. Creating a Strong Relationship between Employees and Management ~ Foster and encourage an atmosphere of trust, honesty, and respect. Protecting specific employees who are likely targets ~ Human resource employees, managers, and you. Establishing Strong Termination Procedures ~ Treat fired employees with dignity. Be sensitive to their feelings of failure and anger. Be sure to include exit interview protocol and security procedures that calmly but clearly remove the terminated employee from company property. Taking all Threats Seriously ~ Identify procedures to report any threats made against specific employees and your company. Be sure to follow up and investigate. Consider Hiring Outside Security ~ Control who goes in and out of your company. Prevent any weapons on your premises. Respond to any violent incidents. Once again, your best offense is a good defense. 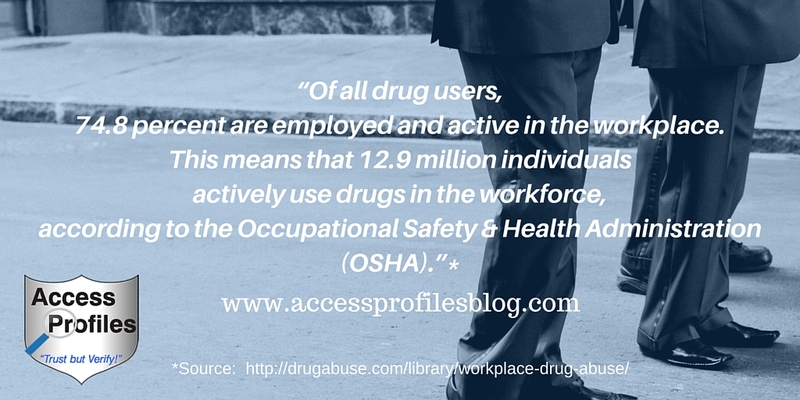 This means creating an effective workplace drug policy that includes a drug-testing program. An Employee Assistance Program ~ Your program should help those that either self-identify their drug problem or who are identified as having a problem. A Procedure to Familiarize Employees with Your Policy ~ Make sure everyone understands your drug abuse policies including use, penalties, and assistance programs available to them. Open and Frequent Discussion about Drug Abuse ~ Informational programs on drug use and how it impacts employee performance. Many times small businesses may think that putting procedures in place to prevent, identify, and manage violence and drug abuse in the workplace is beyond their means or really don’t make much of a difference. This mindset can have serious consequences. Having strong workplace violence and drug abuse prevention and identification policies can actually help your Small Business. An immediate benefit is that your company will be viewed as proactive and prepared. This can attract better employees, increase morale and productivity, and reduce employee turnover. You will also create a safer work environment that can help put your employees at ease. Workplace accidents often decrease, along with fewer insurance and worker’s compensation claims. It is important to realize that employers are often held responsible for the behavior of their employees. You can be found liable for what they do while in your employ. If someone is injured or harmed by your employee, you can be responsible for any compensation they are due. This can include medical bills, physical therapy, and even counseling. It is often easier to assign blame and get compensation from you, the employer than it is to sue your employee. Most importantly, being vigilant against Workplace Violence and Drug Abuse can help protect you against Negligent Hiring lawsuits. Negligent hiring suits are built on the premise that as the employer, you should have been aware of the dangers your employee posed and were careless in hiring them. The blame is placed on you for putting your other employees or clients in harms way. Your number one protection against negligent hiring suits is the Employment Background Check. Making sure to screen for any past issues of violence or drug abuse is key. This is also where recognizing the signs of potential problems comes in. Show that you take the signs seriously. Follow all your procedures to the letter and document everything each step of the way. These steps can help you avoid liability due to negligent hiring. It is important that you are aware of any Potential Dangers to Your Business. Taking the time to recognize and plan for them now will go a long way towards helping Your Company Succeed! In case you missed them, click on these links to Parts 1 and 2 in this series highlighting "Dangers to Your Small Business" ~ "Employees Who Steal” and “Workplace Bullies”. Please Pay it Forward and Share this with any Business Owners You Know! Thanks! Find more Tips to Help You and Your Business Success on our site! You will discover more About Us and how our Background Check Investigation Services can help. Let’s Connect! Visit our Contact Page for links to all our social sites. We would love to hear from you!